Making success in education sustainable | Clarity Innovations, Inc.
A comprehensive guide of mini-lessons, design challenges, tips and tricks to help educators use littleBits in any classroom. 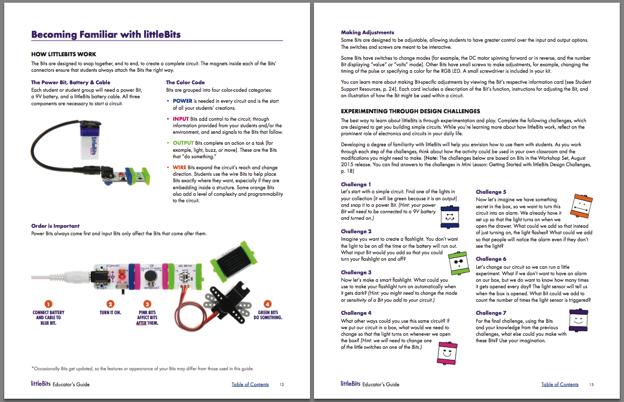 littleBits makes electronic modules that simplify the ability to experiment, tinker, and explore electronics without minding the details of polarity, voltage, soldering, etc. The company wants to democratize technology by making it more accessible and easier for non-engineers to prototype, tinker, and experiment with their own creations. littleBits founder Ayah Bdeir saw a gap between the maker movement and “real education.” She heard from teachers that they couldn’t use maker techniques during regular class time due to the necessity to teach to standards. To move maker spaces into the mainstream classroom, littleBits needed to tie maker projects to standards-based curriculum. Clarity created an Educator’s Guide that addressed key areas relevant to education today: standards-based curriculum, STEM/STEAM initiatives, computational thinking, and the design process used by engineers. Addressing frequently asked questions of individual educators getting started with their product, the Educator’s Guide described classroom management strategies, gave product storage and maintenance suggestions, introduced their education value proposition, illustrated alignment with the Standards of Practice from Common Core for Mathematics and the Science and Engineering Practices in the Next Generation Science Standards (“NGSS”), and referenced good examples from their existing online project collection for suggested activities.